Many of you know that I’ve spent the last couple of years trying to support and grow the Christian Transhumanist Association, an organization devoted to creating a better relationship between religion and technology. I’ve talked before about what Christian Transhumanism is, and what it means, and what our organization is about. But a question that I get from a lot of people is: why the name? 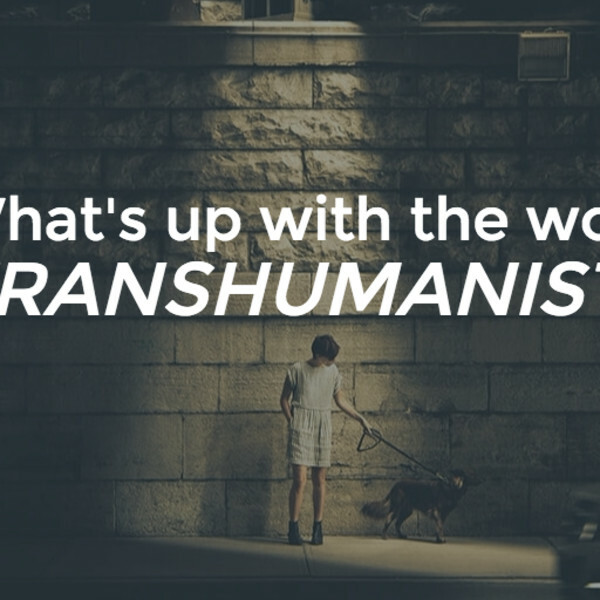 “Transhumanist” sounds weird, maybe even scary. So why use it? Why not call ourselves futurists, or technologists, or some other less bothersome word? There are a lot of factors at work here, and I won’t go into all of them (yet! ), but one thing that draws me so strongly to this word is its poetry and its history. In its very essence, the word invites us to engage with humanity, but also to reach beyond it. It suggests that humanism was right to focus on the glory and possibility of human life — but also that stopping there was stopping too soon. “Transhumanism” is currently a mostly secular movement. But in this fundamental orientation, I think it finds more in common with Christianity than traditional humanism ever did — certainly more than secular humanism ever did. In saying this, Jesus shows us what it means to be human. It is to connect outward to those around us, inward towards coherence, and upward towards God. As human beings, if we are unable to anchor ourselves in that which is beyond us, we lose something significant. Throughout Christian history, this call toward transcendence has been fundamental. And so Christians have struggled over and over to express this idea in new ways—and sometimes—in new words. …seemingly coining the word in the midst of one of history’s most significant works of religious literature. Here we have a profound doctrine of what I call a transcendent humanism, a humanism which says that Christ is the fulfillment of essential man, of the Adamic nature. But perhaps most significantly, the language shows up in the work of Pierre Teilhard De Chardin. Chardin was a Jesuit priest, a paleontologist, and a mind-expanding theorist of the future. Some people credit him with foreseeing the internet, and discussing the possibility of accelerating technological progress leading up to a Singularity…in 1941. And later, in contemplating whether humanity would ultimately vanish beneath the waves of time, as many philosophers and scientists were arguing, he uses the term trans-humanity to describe the spiritual vision that calls to us from beyond the boundaries of the world as we know it. That, as they say, is history. A concept from deep within Christian history had passed over, through the language of a secular biologist, into a new area of culture. Later, secular futurists would pick up the term and run with it, creating the movement known as “transhumanism” today. For us to use the word “transhumanist” is to reconnect with a set of aspirations and visions that began in the Christian tradition. And it is to simultaneously open the door to people looking for a way back to Christianity—which is what I want to talk about next. Miracles vs Magic The Serpent’s Lie Why I hate religion, but love Jesus Religion is justice The Structure of the Biblical Story Partnership with God The Open Future - Creators with God Reading the Bible literally? Jesus Movement A Christian Band?